I have an old 8" dob and it has a R&P focuser all metal but I find myself going back and forth because of slop in the system. I have priced a crawford clone that could be used as a replacement however I would like to use what I have. This is a 2:" metal focuser with a 1.25 insert.,is there a way to make this system better without replacing ? Also is there a 1.25 insert that would give fine tuning focus ? I am seriously trying not to spend a lot of money on this situation. I am sure someone has covered this before so links will be fine. 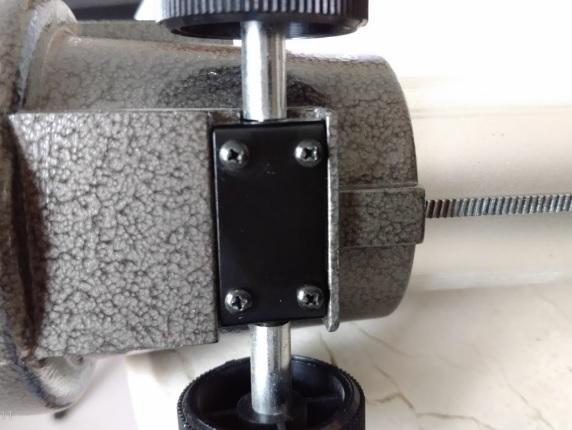 Maybe you could attach some thin pieces of tape along the focuser barrel to increase friction a tad. That would eliminate some of the "slop". If you could post a photo of your focuser, it would be helpful . If it's an Orion Dob or something similar, it can be cleaned and adjusted so it doesn't shift and it's smoother. The Teflon step is optional . These focusers can (with care and patience) be made to work well for lighter eyepeices like Plossls or other lighter weight 1.25" eyepieces, but my experience is that they can be less satisfying when using heavy eyepieces. If you mostly use light eyepieces, then I think it is worth the time to try to tune the focuser. If you see yourself ever obtaining heavier 2" eyepieces, my advice is to just invest in a better focuser. Ok, so you want to tune it. 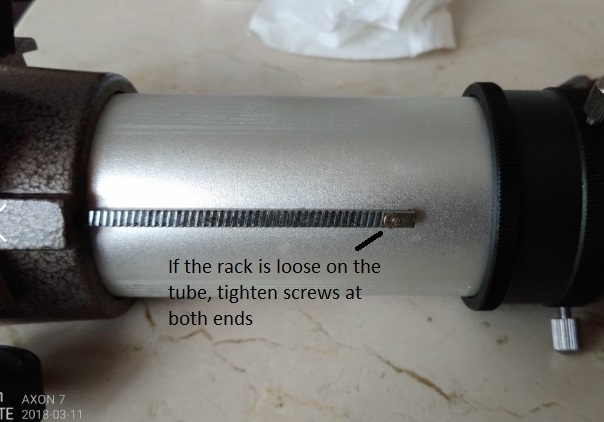 First, a common issue with these focusers is that the screws that hold the rack to the tube can come loose. Rack the focuser out so that you can see the end of the rack itself, then rock the focuser knob back and forth and observe the rack to see if it has any slop against the tube itself. If it does, then simply tightening the screws on either end of the rack (because both will be loose). If the rack is loose, this may solve your problem. Next, typically these focusers have a metal back that holds the pinion gear shaft in place. Some of these use shims to set the gear lash. Others use a spring or a backer. Depending on the design, it may be possible to adjust the pinion engagement and while it can be tedious it can make a big difference. Next, some of these focusers have a nylon strip that is across from the pinion shaft and this strip uses small screws to adjust the pressure of the focuser against the glides. Sometimes it is possible to slightly tighten these screws to make up for wear. Last, are the glides that are generally cast into these kinds of focusers that sit across from the pinion shaft. Vixen and many others had some kind of surface treatment on these and this treatment does wear out.. When it does, even when you have the zero gear lash, the focuser tube will be loose in the housing and this will cause the focuser tube to "chatter" as you rack it in and out. I have tried with little success to correct this kind of problem. Teflon Tape is marginally effective (Scopestuff) but in the end, I found it to be temporary at best. Some of these have a plastic ribbed material with glue on it that acts as the bearing. I am not aware of a source of this material so if yours uses this and they are worn, best you will do will be to fabricate your own replacement. I think very thin strips of Bamboo might work, but would likely require replacement from time to time. Again, if you use mostly light eyepieces, you can probably tweak the focuser a bit. The pinion gear mesh is usually tedious to work with but you can usually get it right. The worst case is if the focuser has glides with the impregnated bearing surface where that surface has worn. It will be almost impossible to restore smooth movement to this kind of glide. Teflon tape will be to thick and even heavy grease will not provide support. I have had zero success restoring this kind of focuser to really smooth operation. 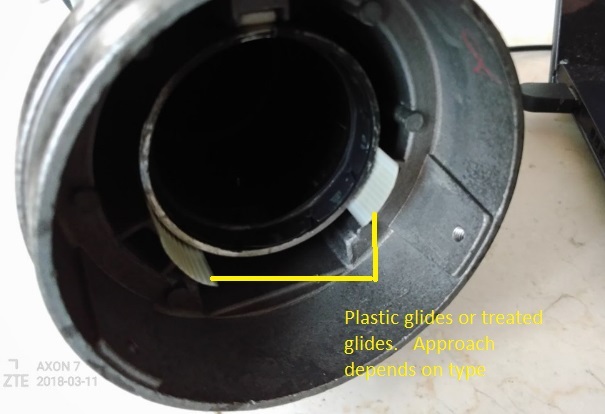 The kind shown in the picture with the glide strips can be made to work because there is sufficient space to allow for the use of alternate materials. Edited by Eddgie, 11 March 2018 - 12:23 PM. I appreciate the ideas and the links, I think the tape may be helpful. I will post a picture later,today I will be out of pocket most of the day. I will have to use my camera as I am still in possession of a dumb phone with a really dumb camera(LOL). I have refused to be enslaved to a computer in my pocket as many of those I work with. Ed's photos and write is very clear and nicely stated . I have reworked more of these focusers than i can count and have a somewhat different procedure. I find they can handle heavy eyepieces quite nicely. - The major difference between Ed's approach and mine is that i first remove the pinion gear and clean the heavy grease from the parts and then regrease it lightly. Even if i do not clean it, i remove the pinion. The first adjustment step is to adjust the two small set screws that apply pressure to the glide. This lets me remove all play between the drawtube and the bearing surfaces and adjust the pressure so its smooth and light. I then install the pinion assembly but do not tighten the 4 screws tight. I adjust them for feel and then when i have it right, I'll use some crazy glue to lock them. - Replacing to corrugated bearing strips with Teflon as described in my link can take it to the next level but is not necessary . I really appreciate the pictures and the good description eddgie DL and Jon. I have several things to work on and best of all, these can be accomplished with just a little time. Well within my budget ! Some great info in here! If I can borrow this topic: I have a lot of play in my focuser tube, and its a brand new one. But I read its a design thing wIth these chinese R&P's. I will have to fix it, because it will interfere with collimation, especially with a laser. Its also kinda bothering at higher magnification because focusing in/out actually moves the image in the eyepiece. I have seen some DIY topics here on CN. I actually made a video of my focuser tube play. Edited by Recretos, 12 March 2018 - 04:50 PM. How is the nylon strip held in place? I have a Meade Infinity 90mm refractor and the focuser stopped working. I took the drawtube out and a long, rectangular piece of plastic fell out. I'm assuming this is what you are talking about. I taped it back up to the top and that worked for a little bit, but after about an hour of use, I guess the tape stopped working and the focuser once again would not work. Thanks to all that gave advice and so much ! I was able to lube and tighten up my focuser and I believe it is no longer a problem. I too have adjusted a number of focusers of this style. 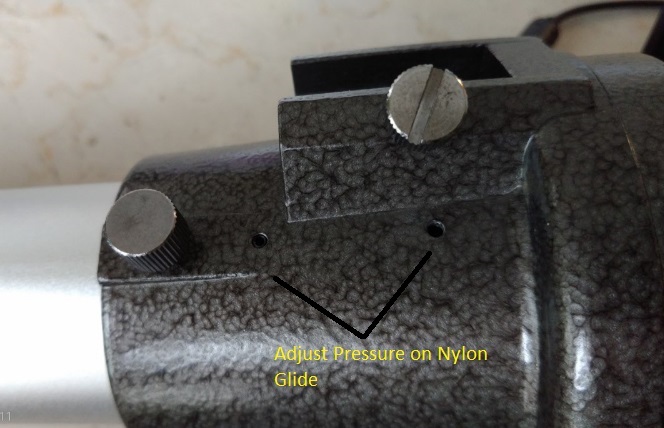 I have found it helpful to replace the two set screws Eddgie has identified in his photos to "Adjust Pressure on Nylon Guide". These set screws are used to take up any slack in the nylon guide against the focuser drawtube and to hold the focuser against the guides on the opposite side of the tube. The problem is that there can be considerable force on the nylon guide depending on what eyepieces are in use, and the pointed set screws tend to dig into the nylon rail and adjustment is lost after a little time. Easy enough to tweek the set screws and tighten it up but there is a limit. Best to replace the set screws. I remove the factory screws, drill out the holes with a number 36 drill and tap the holes for 6-32 dog point set screws. The dog points don't dig in to the nylon guide as far or as fast as the factory cone point set screws do.